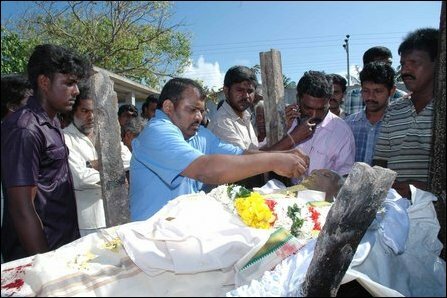 Prominent Tamil political leaders from Tamil Nadu including Vaiko and Pazha Nedumaran paid homage by phone from Tamil Nadu. 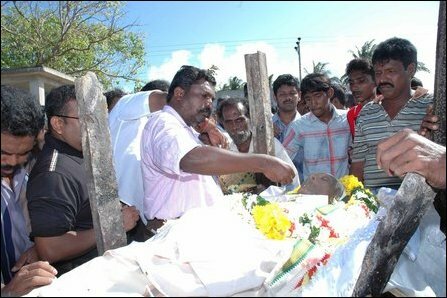 TNA Parliamentarians Sivajilingam and Gajendran were present near Thee’ruvil memorial monument where the remains were kept for people to pay their last respect, from 5:30 p.m Saturday. 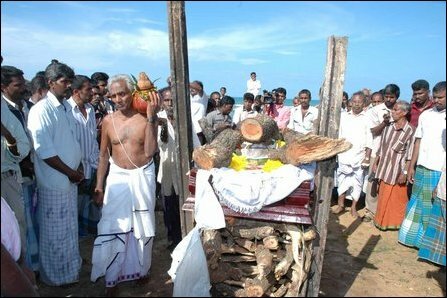 Both were with the remains until cremation. 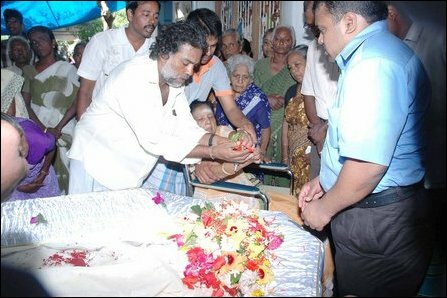 Saturday night, TNA parliamentarians including Mavai Senathirajah, Suresh Premachandran, Pathmini Sithamparanathan, Selvam Adaikalanathan, Vinotharalingam, Sivasakthi Anandan led by TNA parliamentary group leader R. Sampanthan paid their last respects. 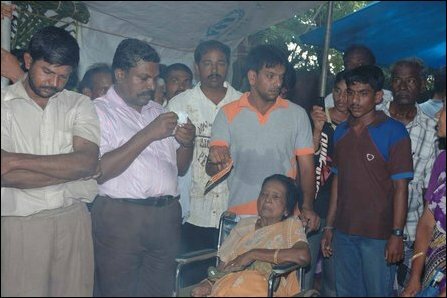 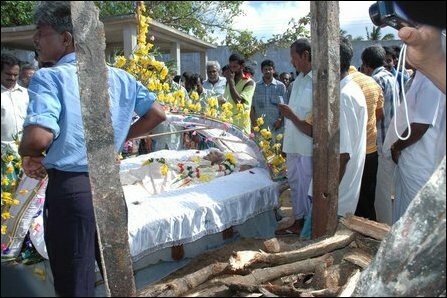 On Sunday the remains of late Thiruvengadam Velupillai was taken from Thee’ruvil to the house in which LTTE leader Pirpaharan was born and from there to the cremation ground in procession. 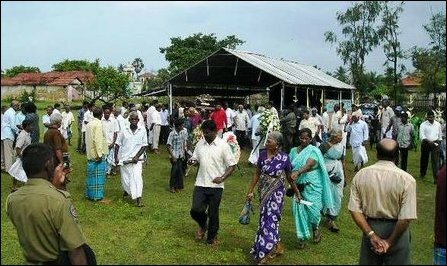 The procession went along Tho’ndaimaanaa’ru-VVT road to VVT junction and from there to Oo’ra’ni along Point Pedro-VVT road. 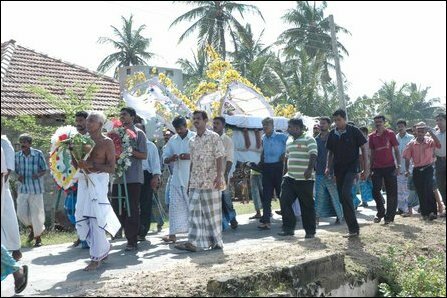 Thousands of men and women and school children from all parts of the peninsula took part in the procession. 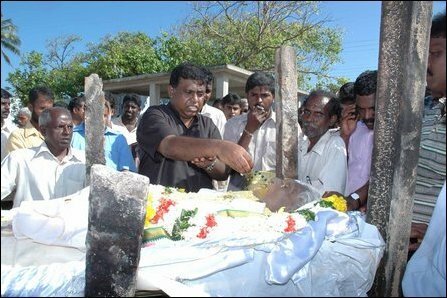 24.02.11 Vaiko urges world leaders to condemn Colombo's des..
24.02.11 Tamil Nadu needs non-political movement for Eezham..
23.02.11 University students protest against desecration of..
23.02.11 Occupying SL military desecrates ashes of Parvathi..
22.02.11 Remains of Parvathi Amma cremated amidst military ..
22.02.11 Colombo gripped by paranoia, say Jaffna university..
22.02.11 Colombo deports Thirumavalavan, rejects participat..
20.02.11 Occupying SL military intimidates mourning for Par..
06.02.11 Pirapaharan's mother's condition serious, not crit..